Friday night May 19th the Millstone Township Fire Company was dispatched mutual aid into Jackson on Rt. 537 by Great Adventure for a reported multiple vehicle accident with possible entrapment. Engine 3275 (Bice), Rescue 3285 (Wehmann) and 3266 (Chief Fiore) responded. While enroute reports confirmed heavy entrapment in multiple vehicles. Jackson Station 56 and New Egypt 39 were also dispatched. 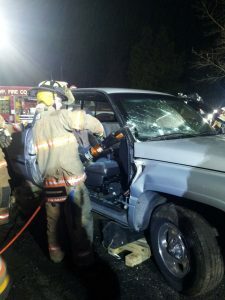 Upon arrival all hands went to work with extrication tools on each vehicle. Jackson EMS coordinated multiple BLS/ALS units and also requested medivacs for each patient. The LZ was set up at Great Adventure. NJSP closed a portion of 537 for several hours while they completed an investigation. 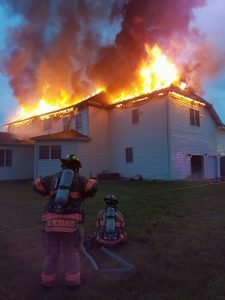 At approximately 5:30 AM on Saturday, April 29th the Millstone Township Fire Company was dispatched as mutual aid into Manalapan Township for a reported structure fire. Shortly after dispatch the call was upgraded to a confirmed structure fire with fire showing through the roof. Millstone’s ladder (32-90) led by Deputy Chief Wagner, Tanker (32-96) driven by FF Jim Carbin and Chief Fiore (32-66) responded along with fire companies from Englishtown (12-1), Freehold Independent (16-1), Monroe Station 57 and RIT Adelphia (19-2). Crews from all companies were met with heavy fire conditions. An interior attack was initially made but due to the large size of the home and roof collapse all crews were ordered out of the structure. Command switched to a defensive attack placing Millstone’s Ladder 32-90 into service with additional blitz lines. Once the bulk of the fire was knocked down crews re-entered the structure knocking down hot spots and began overhaul operations. 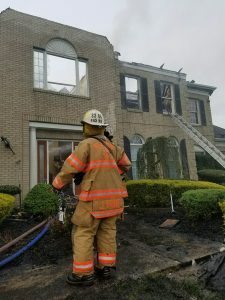 The fire is believed to have been started by a lightning strike and is under investigation by the Monmouth County Fire Marshall’s office. No injuries were reported. 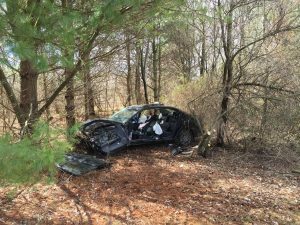 At 11:54 the Millstone Township Fire Department was dispatched to Interstate 195 at MM 14.8 Eastbound for a motor vehicle accident, car into the woods. 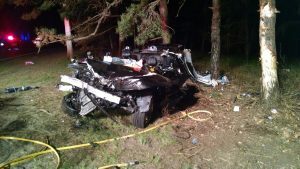 Engine 3275 (Maloney) arrived to find a vehicle in the woods with driver entrapped. 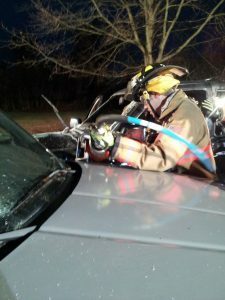 The Engine crew began patient care, cut access to the vehicle with a chain saw, stabilized the vehicle with cribbing and stretched a protection hand line. Once completed the Holmatro tools were utilized to remove both drivers side doors and the B post. Rescue 3285 (Mains) assisted with completing the extrication. 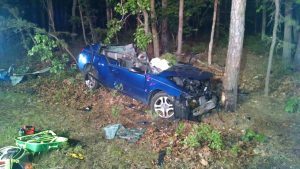 The driver was removed and transported by Millstone EMS and MONOC to Jersey Shore Medical Center. 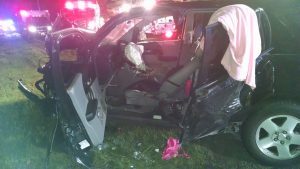 A passenger was transported by Allentown EMS to Robert Wood Johnson. The accident was investigated by the New Jersey State Police. 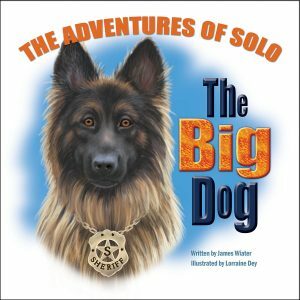 Millstone Township resident James Wiater is the author of The Adventures of Solo, The Big Dog book. 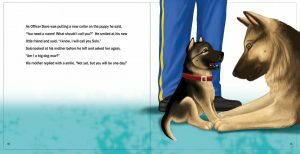 This is not your ordinary children’s book but a book of hope as all proceeds go towards purchasing K-9 Body Armor. The Millstone Township Fire Company is a proud supporter of the Adventures of Solo. 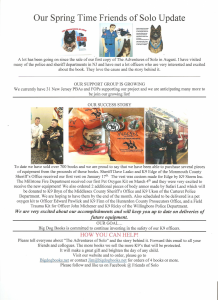 Check it out, I bet your children will love the book, the pictures and know you will be helping to purchase K-9 Body Armor for a future dog. 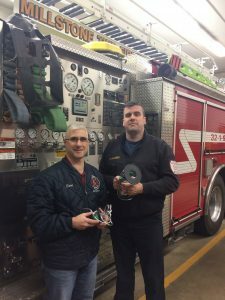 Additionally, Jim has donated to the department the first Pet Oxygen Kit on March 4th. We all know a pet becomes part of the family and is equally important during emergencies. Check out the links below for a great book and a great cause. 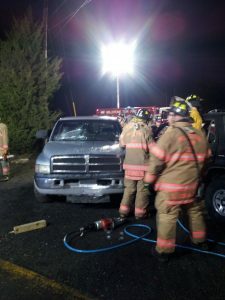 Several times a year the department sharpens their extrication skills utilizing donated vehicles and under differing scenarios. Drills encompass a wide variety of possibilities including school bus accidents, “big rig” challenges with 195 running through a portion of Millstone and motorcycle accidents. 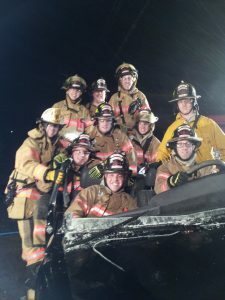 Pictured below is one team assembled in one of firefighters donated vehicle. Hard work and a little fun.